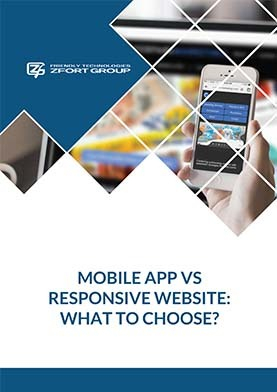 Mobile App vs Responsive Website: What to Choose? “The future of mobile is the future of online. It is how people access online content now." Having mobile presence is essential for any brand today. But before diving deep into mobile app development, ask yourself about the app’s purpose and requirements. Once the answers are clear, it is easy to choose if you should stick with the website or invest into app development. If you’re struggling to decide which way to go, our free e-book will be on hand to help you make an informed decision between native and web. And Zfort Group will be pleased to follow your choice with the development. Receive a custom feedback from our expert. Let's map out the key outsourcing challenges and the ways to overcome those bottlenecks!